This Roasted Vegetable and Farro salad is a year-round favourite dinner salad, but especially nice when Summer produce is at it’s peak. Enjoy warm or at room temperature. 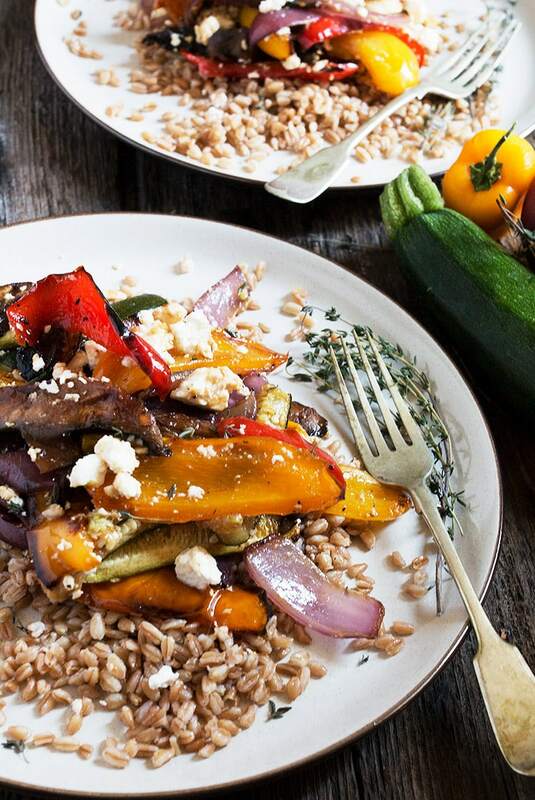 It you’re in the mood for a dinner salad that is hearty, healthy and delicious, then look no further than this Roasted Vegetable and Farro Salad. 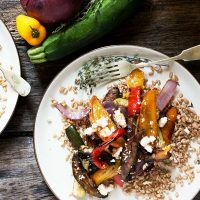 This salad combines nutty, chewy farro with a variety of roasted vegetables, all tossed in a balsamic vinaigrette and serve with crumbled feta. 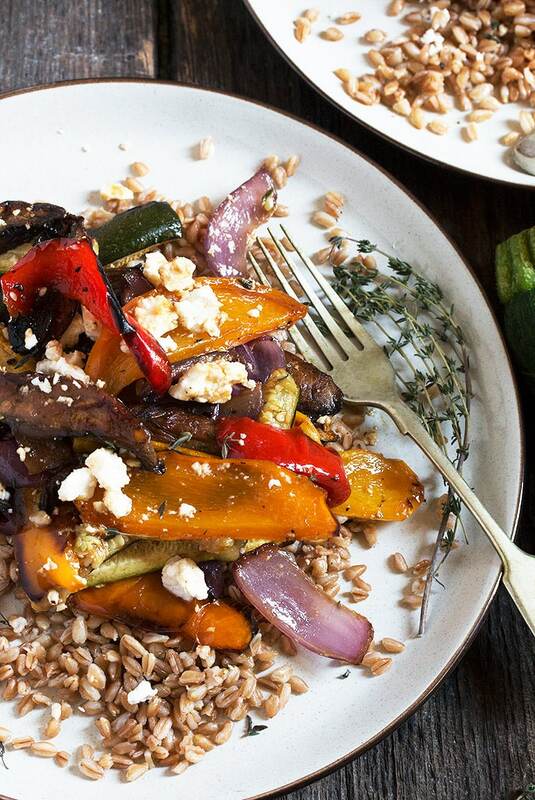 Enjoy this hearty, healthy and delicious Roasted Vegetable and Farro salad warm or at room temperature. This is a great salad year round, but especially nice when beautiful Summer produce is fresh, plentiful and inexpensive. This time of year, it’s easy to find both green and yellow zucchini, as well as red, orange and yellow bell peppers at a reasonable price, so look for those to add lots of colour to your salad. If you love to do vegetables on the bbq, grill them instead of roasting. Great for Summer so you don’t have to turn on the oven. Use whatever vegetables you like here, but do consider the longer cooking time of certain root vegetables vs zucchini, for example. If necessary, start with roasting the ones that need longer cooking first, then add the other, shorter cooking vegetables part way through roasting. I will sometimes use goat cheese instead of feta. Both are delicious, so you won’t go wrong either way! I love to use with semi-pearled farro, that I cook up pasta-style in boiling water, until it is al dente (about 20 minutes). If you have pearled farro, it will take less time to cook (maybe 10-15 minutes, but taste to test). Whole grain farro will take longer to cook. You can cook the farro ahead and refrigerate. To serve later, bring farro to room temperature or re-warm slightly, then simply toss with some of the same dressing you use for the vegetables and sprinkle with salt and pepper to moisten and season. Roast up extra vegetables and use the leftovers (dressed and with cheese) for a sandwich. Perfect on a ciabatta bun! 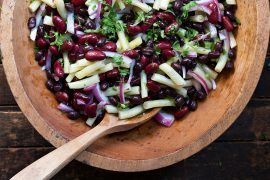 Hearty, healthy and delicious, enjoy this salad warm or at room temperature. A great dinner salad! Cook the farro: Bring a large pot of water to a boil over high heat. Add farro and boil until al dente, about 20 minutes. Drain and remove to a bowl. If making ahead, allow to cool at room temperature for 10-15 minutes, then cover and refrigerate. Otherwise, set aside while you roast the vegetables. Roast the vegetables: Preheat the oven to 450F. Place all the vegetables in a large bowl. Drizzle with a bit of olive oil and season with salt and pepper. Scatter evenly over a large baking sheet. Roast 30 minutes in the preheated oven, stirring once. Remove from oven and switch oven to broil with oven rack about 6-8 inches from the heat. Broil for 3-5 minutes or until lightly charred. Remove from oven and let cool 5 minutes them remove to a large bowl. Prepare the dressing: Whisk all the dressing ingredients together in a small bowl. Set aside. *If you made the farro ahead, remove from fridge to come to room temperature or re-warm slightly to serve. To serve: Toss the farro with 1 Tbsp (or so) of the dressing. Season with a bit of salt and pepper, then scatter a large spoonful onto each of the serving plates. Drizzle the roasted vegetables with some of the dressing, until evenly moistened. Add the crumbled feta and stir to combine. 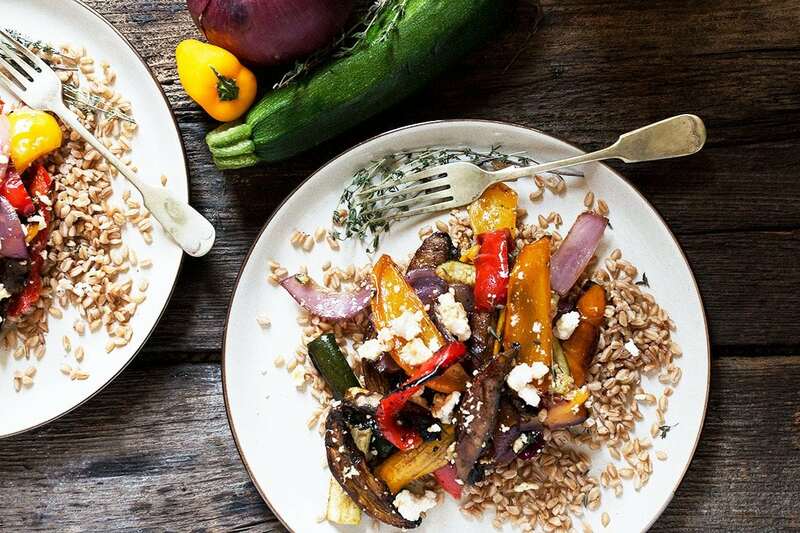 Spoon vegetables/feta over farro on serving plates. Garnish with a few more thyme leaves and some freshly ground pepper. Serve with any additional dressing, for drizzling as needed. 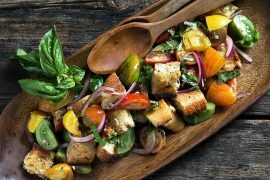 This is my dream summer salad, I love the roasted vegetables! This looks like such a hearty salad Jennifer. I love farro. Always keeps me satisfied. And summer is all about fresh veggies! Thanks Cheyanne and yes, it would be great for meal prepping! 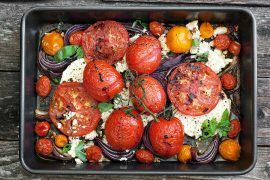 Sue took the words right out of my mouth – I love these summer salads and especially when served with whole grains. Very nice! This is my kind of meal, Jennifer, so colorful and fresh, I love farro, and all grains, for that matter, I think they’ve gotten a bad rap lately with the gluten free craze.